It finally feels like Fall in central Texas, so we’ve been taking Tot School outside. To go along with the cool weather change, I’ve been teaching Corbin and Lynley about leaves, i.e. what colors they turn, how they fall from the trees, the different shapes they come in, etc. This has been one of my favorite lessons to teach because they have loved it, and caught on really quickly to the concepts. 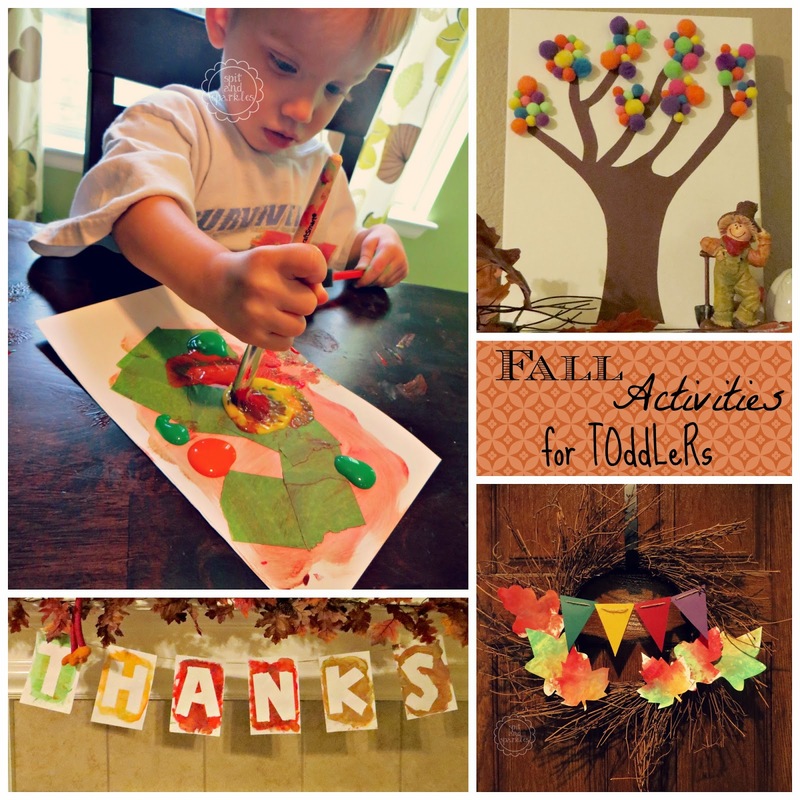 Here are some toddler-friendly, educational activities for Fall. Scavenger Hunt: Grab a paper sack for each kid and take off! 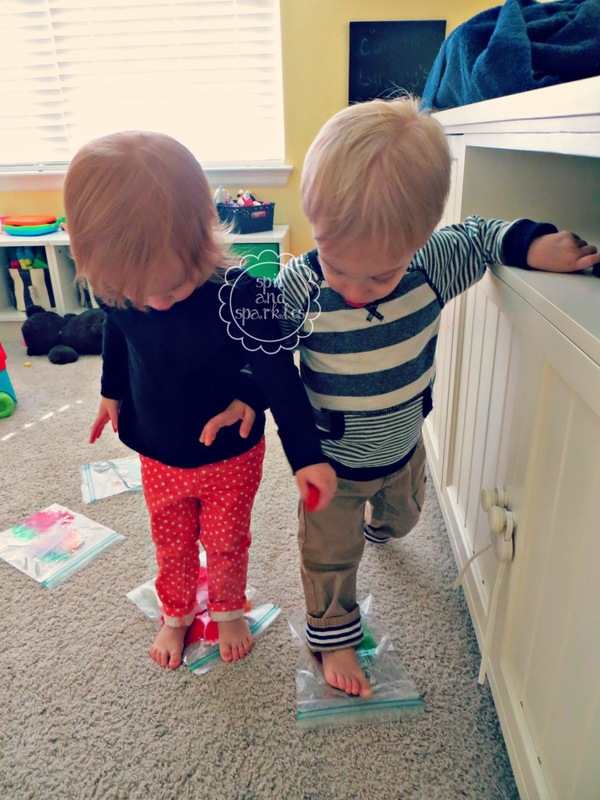 Corbin and Lynley loved collecting leaves in different sizes, colors and shapes. We also tried to find acorns and sticks. Talk to your children the entire time about what you’re doing and what you’ve found. Ask them questions, like what color is the leaf that you found? Can you show me a big leaf, a small leaf? What type of animal eats acorns? Where do the leaves on the ground come from? Leaf impressions: Once you’ve collected your leaves, lay them underneath a sheet of white paper and rub crayons on top to create an impression of the leaves. 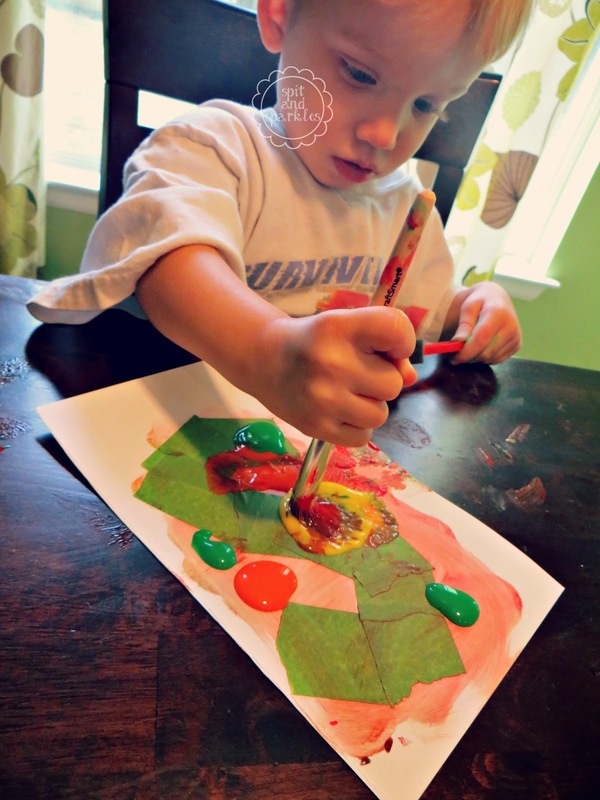 We chose to use fall colors, and Lynley really enjoyed this activity. The leaves were almost unrecognizable after she finished her masterpiece, but the activity was really more about learning colors of fall anyway. Matching colors: Another activity for your collection of leaves is to match their colors to corresponding colors of construction paper. We found brown, green, yellow, orange and red leaves. Corbin loved playing with the leaves and stacking them in piles. He also like to rip them up, but boys will be boys…. Once you’ve matched all of the leaves to the appropriate colors, practice counting with your child. Ask your children if they can tell you which color has the most leaves. 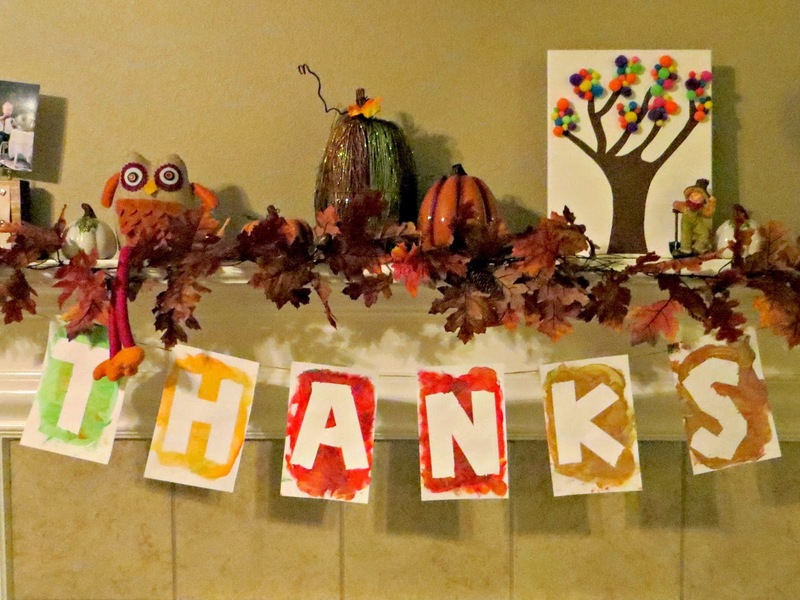 Letter painting: Speaking of messages, and while you have your paint out… try this idea: using painter’s tape (I used Frog tape), lay out the letters to spell THANKS or GIVE THANKS, THANKSGIVING, etc. on sheets of card stock. Have your tot paint strokes or swirls on the paper, then once it is almost dry, carefully peel off the tape to reveal the colorful message. Original idea found via this pin. Button art tree: Who doesn’t have old buttons lying around!?! (If you don’t, you can do what we did and use pom poms!) Collect them in all shapes, sizes and colors. Just to be sure to keep a keen eye on those sneaky tots who still like to put everything in their mouths! 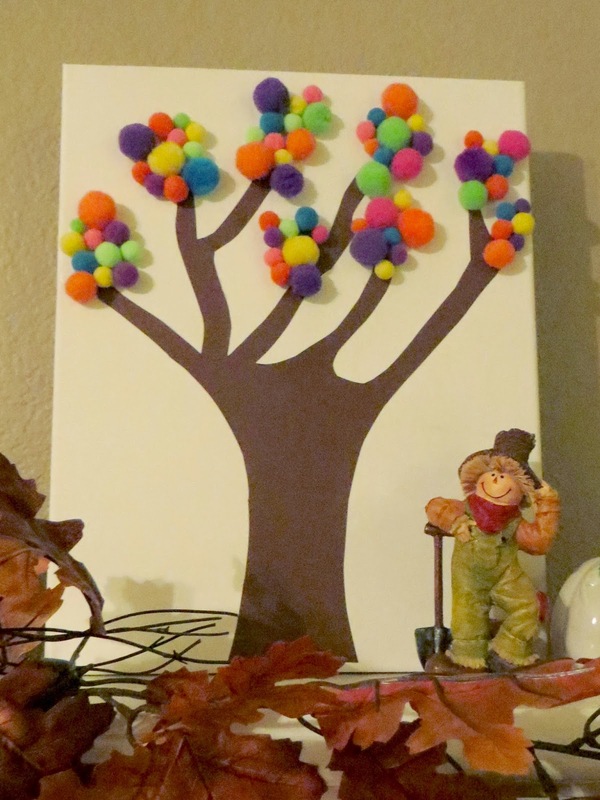 Draw a tree on a canvas or cut one out of brown card stock and glue to your canvas. 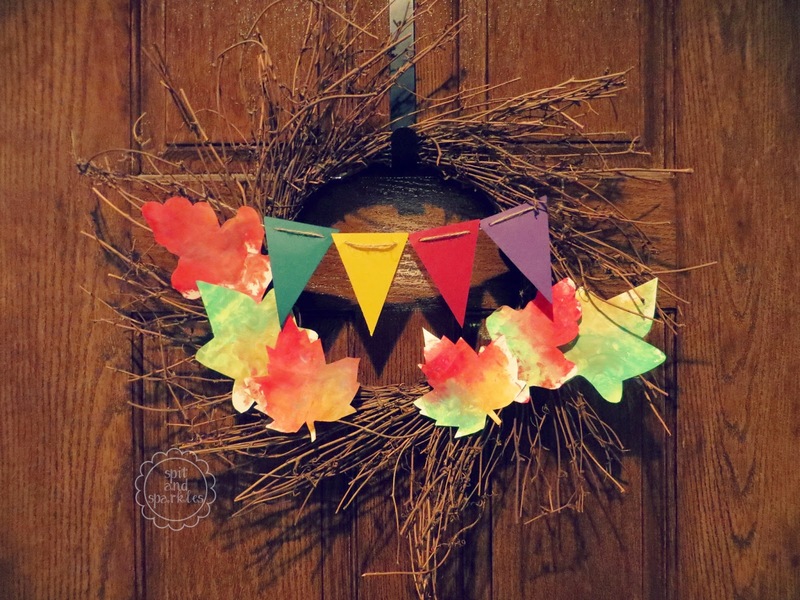 Next, help your children glue buttons to the branches to resemble leaves. As you go along, ask your children to name the colors or shapes of the buttons each time they choose another one to glue down. This craft is totally frame-worthy, and makes a great gift! (Full disclosure: I did most the work on ours. C & L couldn’t resist taking off the balls we had already glued down, but they did like the way the glue felt and tasted…) Original idea here. The biggest advice that I can give for Tot School is to stick with an underlying theme for every activity. Ours was leaves and the colors of fall. Within the lessons, we also practiced counting and saying the words leaves, leaf, fall and autumn. Spread your activities out over the course of a week, and you may choose to repeat some that your tots really like and ditch one or two that they weren’t interested in. Thankfully, mine were interested in all of the leaf crafts! 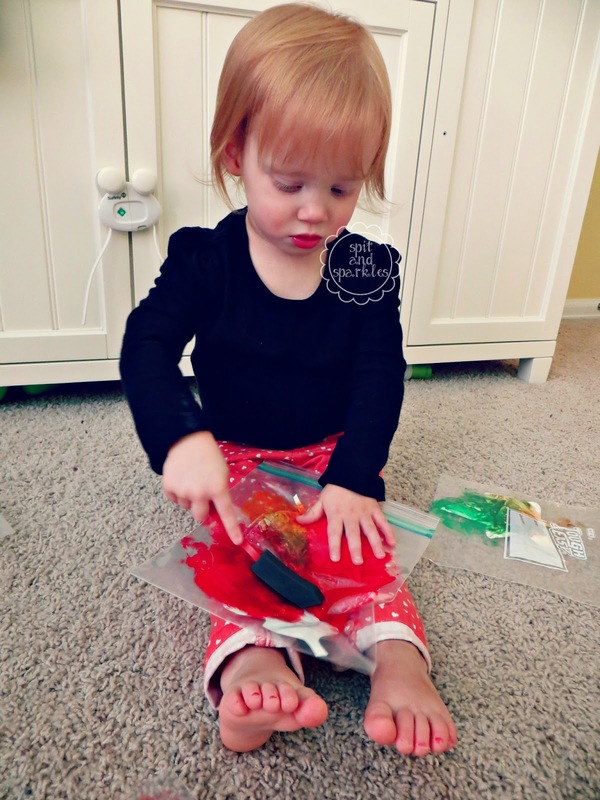 Tot school doesn’t have to be a lot of work! Simple activities like these really work. By the end of the hour on the first day of “leaf school,” Lynley could identify the colors brown and green correctly. Later in the evening after we had switched gears, Corbin was still fascinated by the leaves. He was collecting them in his little dump truck and stopped to look at me. He showed me a leaf and said proudly, “Leaves change color!” This made me so proud! I hadn’t even been talking about leaves for at least two hours. I said, “That’s right! And can you name some of the colors they turn?” Corbin said, “Brown!” <Proof in the pudding. Keep at it moms! They really do hear us!